Boytrapped - The Story of the Statens: The Eagle Has Landed! 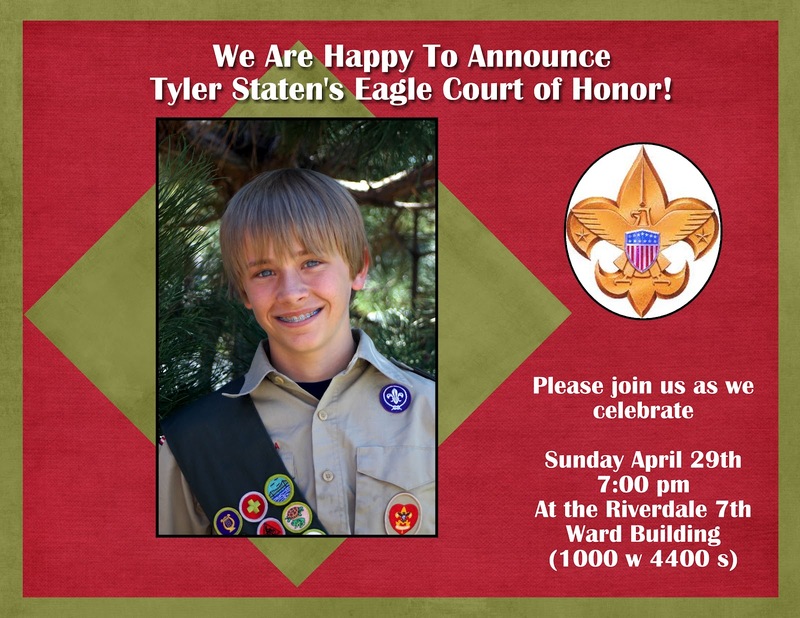 I can't believe it but tonight was Ty's Eagle Court of Honor! He's such an amazing kid! He's 13 and has his Eagle! Tonight was great! Matt and Isaac and the Cub Scout cousins (and Lucas) did the flag ceremony and they were so cute! I sure am glad that I get to be the mom of boys!! It was so fun to be a part of the whole thing! I was a little nervous....since this all new territory for me. I wasn't sure how the program would turn out. I didn't want it to be to long. Or to short. BUT I think it turned out GREAT! I read a poem, Mike got to talk for a minute (It helps to be the scout master:) John Christiansen spoke for a minute since he was Ty's scout master for a while and he was receiving the mentors pin. Tyler opened the time capsule that he made as a cub (that was SO GREAT!!!) and I think the thing that made the night was the DVD that Mary made. It made me cry! Then we had dessert! Ty's on a lemon kick so we had Lemon Bars and Lemon aide and Lemon heads.....and chocolate bowls and Ice cream sundae's and other yummy cookies and brownies. It's hard to put my feelings into words.....I'm just thankful that I have a great kid! I love you Tyler and I'm so proud of you thanks for setting such a GREAT example for your brothers!! !